I think they liked it!? 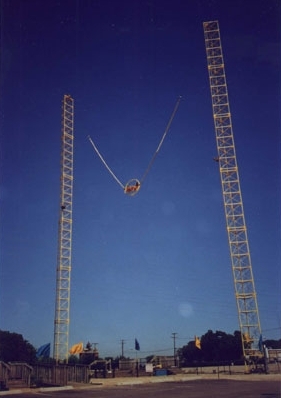 The Ejection Seat was the most extreme ride I ever been on. 160 feet up in the air, 80 mph in 2 seconds. Listen well to hear my Dad's Reaction. My nephew and I take on the ejection seat in Branson, MO. Best ride I've ever ridden! To call the Ejection Seat the most thrilling, heart-in-your-throat experience is no understatement. A wide range of tower and seating options allows for two, three, four or eight passengers to be catapulted into the air, going from zero to sixty miles per hour in one second. No doubt about it, it’s the ultimate rush. In its first month on the market, the Ejection Seat was featured on CNN, USA Today, NBC, CBS, ABC and numerous international networks. The Ejection Seat has become a larger-than-life, customer magnet showpiece for many parks. It’s so amazing and fun to watch that many onlookers quickly become paying customers. Not only can you charge from $20 to $40 for each rider, but Gravity Works/BCI has an exclusive seat-mounted video camera that produces a must-have souvenir video tape. The Ejection Seat was designed with extreme safety in mind. Every Ejection Seat is built with only the strongest, highest-quality materials and each strategic part is connected with full-penetration welds. It has been tested by our state-of-the-art computer-assisted design and engineering programs so it stays up and running safely for as long as you own the ride. It exceeds ASTM-F24 standards and has passed every state, provincial and international inspection easily. For the last twenty years, The Ejection Seat has been one of the highest grossing, most profitable extreme ride in the world. It has grossed over $25K in a single day! Every Ejection Seat comes with 24-hour technical support that continues throughout the life of the ride. We’ll give you help with the implementation, installation, and start-up operations for the Ejection Seat. Low-cost liability insurance is available and Gravity Works/BCI provides one of the strongest warranties in the industry.